Home Dallas Icelandair to Launch Service to DFW! More news hot of the press from DFW Airport! So it’s only been about a week, but DFW has landed a second Icelandic carrier with service to Reykjavik. This is truly exciting times for those of living in the Metroplex because it pretty much means we have near daily service to Iceland starting next summer. The carrier announced that it would operate the flights on Tuesday, Thursday, Saturday, and Monday using a Boeing 757-200 aircraft featuring 22 Saga (Business) Class Seats, 41 Economy Comfort Seats, and 120 Economy seats. 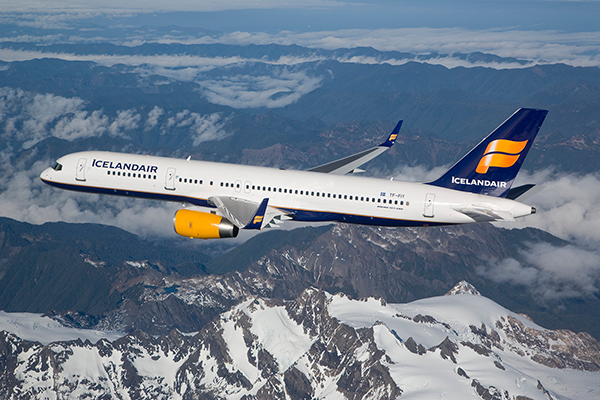 Icelandair of course is a full service carrier and will offer a free checked bag to your final destination, unlike WOW Air, but that really comes at a price. The flight is ideally timed for connections onto mainland Europe and the UK where Icelandair has around 30 destinations. However,the aircraft utilization on these routes isn’t very good considering that the 757 will just be sitting around at DFW for around 20 hours at a time. This is much similar to what competitor WOW Air will be doing on Tuesday Thursdays and Saturdays. It sounds to me like Icelandair wanted to get its foot into the door before WOW Air decided to go daily with its A330 flights because WOW Air has just as bad aircraft utilization and if demand were to go up, they could easily increase it to daily service. Also it’s important to note that Icelandair does not have lie flat seating in its Saga Class so that pretty much evens the playing field between the two in my mind. Of course this serves as another landmark for DFW with Icelandair becoming the 17th international carrier to serve the airport. And it really is a testament to how fast the Dallas/Fort Worth Area is growing on the international scene. There is still a long way to go of course because the total number of European destinations served from DFW nonstop stands at a miserly 6 right now. But it has been a great start!